Bourekia (μπουρέκια) are traditional handheld pies and can be baked or fried and filled with all sorts of sweet or savory fillings. Popular vegan fillings for bourekia include mushrooms, spinach, caramelized onions and this recipe for potatoes with leeks. The most well known type of bourekia in Greece are not vegan and made with Ansari, a sweet soft cheese, as a base with other fillings but you won’t miss the cheese in this recipe, I promise! The potatoes and leek in this filling make for a hearty, flavorful, rib-sticking good pie. It was a rainy, dreary January day in Edipsos on the island of Evia when I first tucked into one of these potato pies. They were the bakery’s special of the day and I loved them from the first bite. 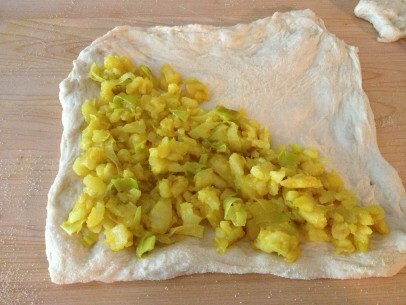 Warm bread dough filled with simple ingredients – potaoes, leeks, olive oil and something else…. Curiosity finally got the better of me and I asked the baker if the golden color, delicious flavor came perhaps from saffron and he very generously shared the secret – turmeric and fennel seed! Bourekia can be made with a thick village variation of filo dough, different from the paper thin sheets normally used for spanakopita or baklava. 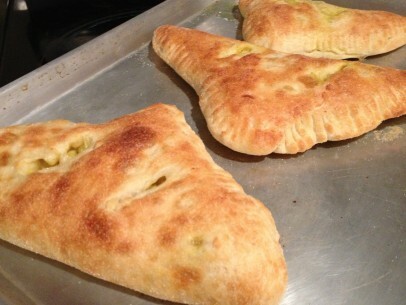 They’re often made with a simple yeast dough and that is my favorite. The dough rises light and fluffy around a rich, hearty filling – win, win! Leeks add the perfect layer of texture and subtle onion flavor to your filling. 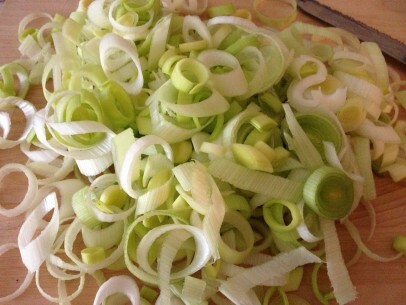 Cut your leeks into thin, round slices starting from the white bulb and stopping at the darkest green part of the stalk. Save those end leaves for vegetable stock, they’re full of flavor. Separate the slices before adding them to the pan for even cooking and saute them gently in the olive oil over low heat to bring out their sweetness. I like to use new spring or red potatoes. They boil up soft and fluffy and soak up the leak/olive oil flavors beautifully. Boil the potatoes with skins on to save yourself peeling. The skins just rub right off after the potatoes are boiled. 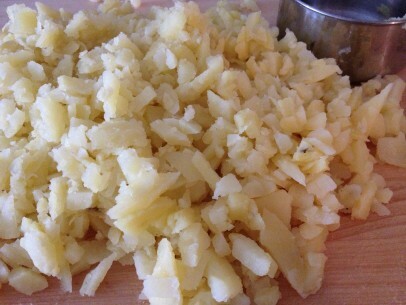 I chop my potatoes with a knife into bits sized pieces but feel free to mash if you like. I happen to like the meatier texture of chopped but its totally up to you. Turmeric adds an special earthy, delicate layer of flavor and a lovely soft yellow color to your filling. Fennel seed, just a scant 1/4 tsp of freshly ground seeds, adds a light, almost licorice flavor which you might not think would work but it absolutely does! 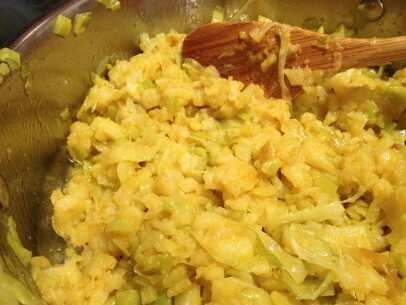 Mix the turmeric and ground fennel seed into the leek/potato mixture well as it sometimes likes to clump up. The mixing does double duty here not only incorporating the spices but also incorporating the olive oil into the chopped potatoes, so mix away! I like to use good quality grocery store pizza or bread dough and get 8 meal sized (4 oz of dough) bourekia or 16 smaller (2oz of dough) bourekia out of 2, 16oz bags. On a floured surface, turn out dough and allow to come to room temperature – about 30 minutes. Then, gently pull, push and stretch your rested dough into a square, don’t try to roll it out. I like to use a square shape and fold over corner to corner like an apple turnover. Just pinch or fork-crimp the edges closed. You shouldn’t need to use water, the sides should stick to each other easily. Dough note: use semolina flour to flour the surface of your counter or cutting board and add a bit of semolina to the bottom of your sheet pan. Its perfect for preventing sticking, even on humid days, and doesn’t dry out your dough with added all purpose flour. Because your using very high heat (5oo degrees) either don’t use parchment paper to line your baking sheet or make sure to use high heat safe parchment paper. I find a dusting of semolina works fine at this high temp without burning. Make sure to cut at least one vent in the top of each pie for steam to escape or you may blow up your bourekia! Lightly brush the tops well with olive oil for a beautiful golden color. Depending on your taste, a sprinkle of course sea or kosher salt over top is a nice touch. These bake up quickly at very high heat so make sure not to leave the kitchen until these are out of the oven. You want them to be a soft, golden brown. And consider baking your bourekia on two sheets pans layered on top of one another to give you a thick bottomed pan. Turn dough out of bags onto lightly floured surface. Allow to rest and rise slightly, coming to room temperature – about 30 minutes. Boil and, when cool enough to handle, peel potatoes. Chop into smaller than bit sized pieces and set aside. Saute leeks gently in olive oil over low heat about 5 minutes or until soft. Add chopped potatoes and mix well. Add spices and again, mix well until completely combined. Remove pan from heat. set aside. 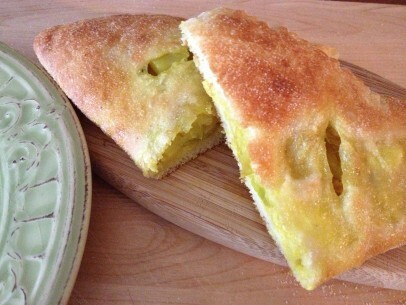 Cut each ball of rested dough into 4 pieces for a total of 8 pieces. Stretch, do not roll, each piece into a square shape about 5-6″ square. Fill each square with approx 4-5 heaping teaspoons of potato/leek filling and close, corner to corner like an apple turnover. Transfer carefully to sheet pan lightly dusted with semolina flour. Brush with olive oil, cut vents into the tops and bake in 500 degree oven for only 10 minutes until the pies have risen and are golden brown. Serve straight from the oven or at room temperature. If reheating, wrap in foil and warm in 350 degree oven for 10-15 minutes. ***** Quick note, the filling used in the Greek Vegan’s Mushroom Pita doubles as a delicious boureki filling. Add chopped, boiled potatoes to the mushroom filling for a fantastic flavor combination. Just make sure to drain the mushrooms well so you don’t get a soggy bottom crust. It’s especially important to make multiple vents in your pies before baking when using a filling like mushrooms which will release more liquid. 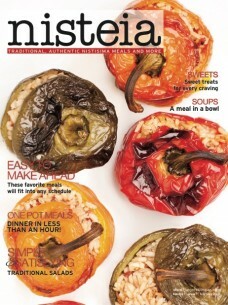 Find 50 of your favorite nistisima recipes, including Greek peas, in one convenient and beautiful collection of 40 full color, glossy pages – Nisteia Magazine! Your bourekia look and sound great! I love leaks. I will try them sometime. I just made these. They are awesome! They were great even though I did roll out the dough… They’re just fine and I baked them at 478-480 since I used my Silpat May which can only be used upto that heat. Thanks again for posting these wonderful recipes!